A pilgrim who "failed to die as was ordained". He was once a sorcerer in Vinheim. He vows his service to the player and offers to "tease out your true strength", as he is keenly aware that those branded by the Darksign possess "something quite special". He can give you power by using your Dark Sigil. Even if you don't accept his offer to draw out your strength, Yoel will eventually die after you enter the Catacombs of Carthus, apparently of natural causes. 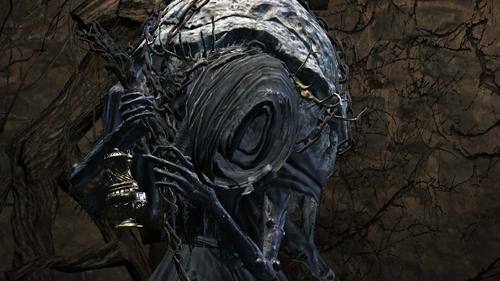 When visiting Firelink Shrine in another time, when it is dark, you will find the Hollow's Ashes near where his body was. The description of the ashes explains that Yoel "faithfully served a woman, only to become separated from her". Presumably, the woman is Yuria, who appears in his place after he passes away. "Please, grant me death. Undo my shackles." "Ohh… Ohh, then it's true. A Champion of Ash, as I live and breathe. To be in your presence is a great honour. I am Yoel of Londor, a pilgrim as you can see. Only, somehow, I failed to die as was ordained. Well, perhaps my calling lies elsewhere. Say, Champion of Ash, how does the idea of taking me into your service strike you? I was once a sorcerer, surely I can be of use?" "Ohh, I am honoured, truly. I should be dead, yet you have granted me purpose anew. I, Yoel of Londor, do solemnly swear myself to you." "Be safe, Champion of Ash." "Then, shall we begin? Bearer of the Darksign, let your true strength shine…"
Umbral ash of a Hollow who faithfully served a woman, only to become seperated from her. With this, the shrine handmaid will prepare new items. It takes but a brief glance at this thing to easily envision Londor, the foreboding land of Hollows. A black, gaping hole in the flesh that resembles the brand of an Undead. The darkness of humanity seeps from this bottomless pitch-black hole, the gap filled by the accumulation of the curse. This Dark Sigil will never heal, but there is a tale told of a Fire Keeper who returned from the Abyss, and brought great comfort to a bearer of the curse.